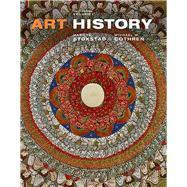 Art History brings the history of art to life for a new generation of students. It is global in scope, inclusive in its coverage, and warm and welcoming in tone. The guiding vision of Art History is that the teaching of art history survey courses should be filled with equal delight, enjoyment, and serious learning, while fostering an enthusiastic and educated public for the visual arts. The Sixth Edition has been revised to reflect new discoveries, recent research, and fresh interpretive perspectives, as well as to address the changing needs of both students and educators. Art History, Sixth Edition is also available via Revel™, an interactive learning environment that enables students to read, practice, and study in one continuous experience. Marilyn Stokstad (deceased), teacher, art historian, and museum curator, was a leader in her field for decades and served as president of the College Art Association and the International Center of Medieval Art. In 2002, she was awarded the lifetime achievement award from the National Women’s Caucus for Art. In 1997, she was awarded the Governor’s Arts Award as Kansas Art Educator of the Year and an honorary degree of doctor of humane letters by Carleton College. She was Judith Harris Murphy Distinguished Professor Emerita at the University of Kansas, Lawrence. She also served in various leadership capacities at the University’s Spencer Museum of Art and was Consultative Curator of Medieval Art at the Nelson-Atkins Museum of Art in Kansas City, Missouri. Michael W. Cothren is Scheuer Family Professor of Humanities and Chair of the Department of Art at Swarthmore College, where he has also served as Coordinator of Medieval Studies and Chair of the Humanities Division. Since arriving at Swarthmore in 1978, he has taught specialized courses on Medieval, Roman, and Islamic art and architecture, as well as seminars on visual narrative and on theory and method, but he particularly enjoys teaching the survey to Swarthmore beginners. His research and publications focus on French Gothic art and architecture, most recently in a book on the stained glass of Beauvais Cathedral entitled Picturing the Celestial City. Michael is a consultative curator at the Glencairn Museum in Bryn Athyn, Pennsylvania. He has served on the board of the International Center of Medieval Art and as President both of the American Committee of the International Corpus Vitrearum and of his local school board. When not teaching, writing, or pursuing art historical research, you can find him hiking in the red rocks around Sedona, Arizona.